﻿ Matthew 25:31 "But when the Son of Man comes in His glory, and all the angels with Him, then He will sit on His glorious throne. "When the Son of Man comes in his glory and all the angels are with him, he will sit on his glorious throne. But when the Son of man comes in his glory, and all the holy agents with him, then he will sit on the throne of his glory. When the Son of Man comes in His glory (His majesty and splendor), and all the holy angels with Him, then He will sit on the throne of His glory. "But when the Son of man comes [back] in [all] His splendor, accompanied by all the angels, then He will sit on His throne of splendor. 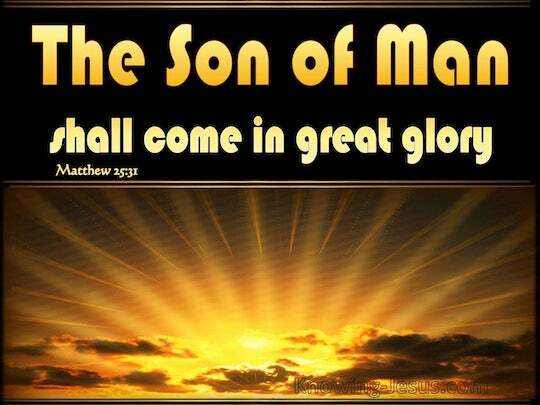 "When the Son of Man comes in his glory, and all the angels with him, then he will sit on his glorious throne. When the son of man shall come in his majesty, accompanied with all his holy angels, he shall sit upon the throne of his glory. 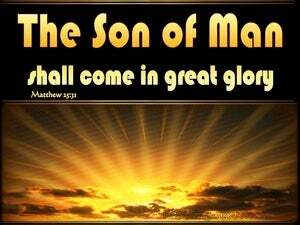 When the Son of man shall come in his glory, and all the angels with him, then shall he sit upon the throne of his glory. 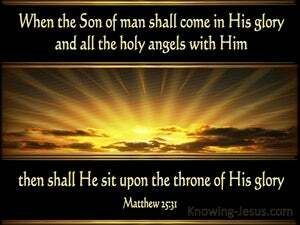 Now when the Son of Man comes in his glory and all the angels with him, then he will sit on his glorious throne. But when the Son of Man comes in His glory, and all the holy angels with Him, then He shall sit on the throne of His glory. "When the Son of Man comes in his glory and all the angels with him, then he will sit on his glorious throne. "But when the Son of Man comes in his glory, and all the angels with him, then he will sit on the throne of his glory. "For whoever is ashamed of Me and My words, the Son of Man will be ashamed of him when He comes in His glory, and the glory of the Father and of the holy angels. And He said to him, "Truly, truly, I say to you, you will see the heavens opened and the angels of God ascending and descending on the Son of Man."